UPDATE ; By a press note dt 3.8.2015 High Court of Kerala Registrar denied the news that the Chief Justice asked the registrar to submit a report. Read the Report here . In an unprecedented development, the Kerala High Court on Friday ordered an enquiry to be conducted by the Chief Secretary against the Advocate General's (AG's) office for failing to secure instructions in 4 cases registered by the Vigilance and Anti-Corruption Bureau (VACB) under the provisions of the Prevention of Corruption Act which relates to alleged illegal assignment of around five acres of government land to two persons. The order was passed in a batch of cases filed by K K Gopalakrishnan, who was a revenue official at Peringome village office, and others seeking to quash the First Information Report registered against them by the Vigilance and Anti-Corruption Bureau. One of the said cases which was considered by Justice Alexander Thomas was filed from the office of the advocate general's lawyer son, Millu Dandapani, the Times of India has reported. The newspaper reported that Justice Alexander Thomas expressed his anguish at the lack of interest shown by the Government in conducting certain cases and how the orders issued by the Court were not being implemented. He said in the interim order passed on Friday, "It is really agonizing for this court to see the manner in which litigations are being conducted in this matter. This court has as early as on 4.6.2015 alerted the Government to take care and protect its interest so that in case stay orders are not be granted in this case, it should not be granted, but the Court should be appraised of the reasons as to why stay shall not be granted. Otherwise, the court has to proceed on the basis of available materials." Despite asking the AG's office to verify facts, it failed to deliver. Such attitude amounts to contempt of court. The laxity in executing orders could not be permitted. The AG is keen on certain cases. If the situation prevails, the AG's office needs to be restructured. None of the orders issued by the courts are implemented, the court noted. If the state of affairs continues, an inspection has to be carried out by appointing a retired Supreme Court judge as amicus curiae, the High Court warned. Asking the Chief Secretary to conduct a proper and effective enquiry, the court directed that officers superior to the chief secretary should not guide or advise him during the enquiry. “The Chief Secretary should inquire into the mishap and how repeated attempts of the court to secure instructions from the authorities have been frustrated. A proper and effective inquiry should be made by none other than the Chief Secretary and the report should be directly furnished by him to the Registrar General. In the process, the Chief Secretary should not be guided or take advice from superior officers,” Justice Alexander Thomas directed. The order was passed in a batch of four petitions filed by the accused in a case registered by the Kannur unit of Vigilance and Anti-Corruption Bureau. The case relates to allegedly illegal assignment of government land admeasuring about five acres, to two persons with the assistance of five revenue officials. The accused had approached the court with a prayer to quash the case saying that the assignment was done as recommended by an order issued by the revenue department. On June 4, the court had asked the state government to inform whether the order is applicable in this case or not. When the case came up before the bench on Friday, the Court pointed out that no satisfactory information is being furnished by the government. During the hearing, the court criticized the government for not providing information in certain cases and said it amounts to obstruction of justice. Further, the court observed that special interest is shown in some cases to see that the court is granting interim orders, or stays. The Times of India reports that a counsel representing Millu Dandapani, the counsel for one of the petitioners, informed the court that their office is relinquishing the vakalath in the case. It is learnt that the Court then observed that no order was required to be passed in a situation where valakath is sought to be relinquished. In a related development, the Chief Justice summoned the files related to the case in which Justice Alexander Thomas had made remarks, for scrutiny and directed the Registrar (Judiciary) to submit a report. By a press note dt 3.8.2015 High Court of Kerala Registrar denied the news that the Chief Justice asked the registrar to submit a report. Read the Report here . Also read "Govt. 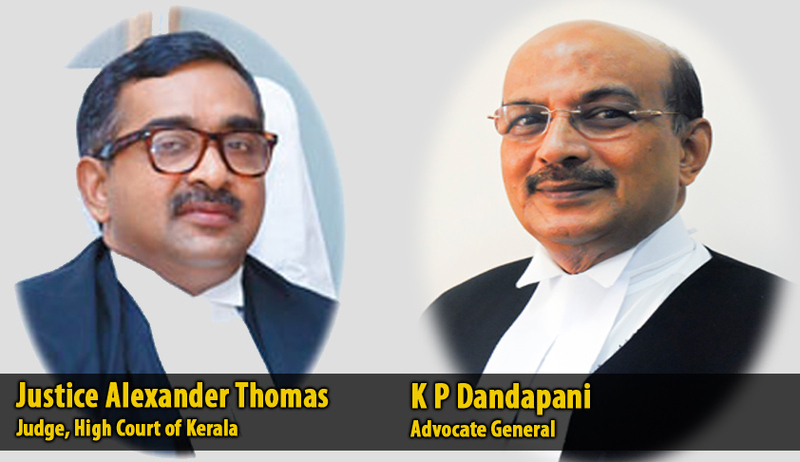 Pleaders protest “uncharitable” criticism of their functioning by Justice Alexander Thomas; submit complaint to Kerala CJ"